QED Style is pleased to announce availability of our Spring 2015 apparel collection. Included in this latest offering are additional color selections of our popular Logan, Uinta, Kamas and Logan polos. The Logan polo has long been our most popular shirt with its distinctive snaps and color-coordinated overstitching made it an easy decision for us to expand the pallete. New this year, the Logan will be available in Coral, Sky Blue, Cinnamon and Slate. Like all of the Logan Polos, each color will have a unique snap and overstitch to complement the base color. In 2014 we introduced a raglan style polo called the Uinta. This rare two-piece construction took over a year to develop. With no seams on the back or shoulders, the Uinta polo fits perfectly over the shoulder and is ideal for the rigors of the golf swing. The short 3 brushed metal snap placket creates clean distinctive lines. For Spring 2105 we have added black, peach and ocean blue to the Uinta collection. "I loved the classic cowboy shirt growing up: the pearl snaps, the pockets and the stitching. There is something very American about it. We wanted to take this concept and apply it to golf. The Kamas is made of the same premium polyester fabric found in our Logan polo. After finding our favorite plaid pattern, we sprinkled in some faux antler snaps and created some QED Style." Beyond the polos, we have also expanded our shorts and trousers collection to include more colors and sizes. 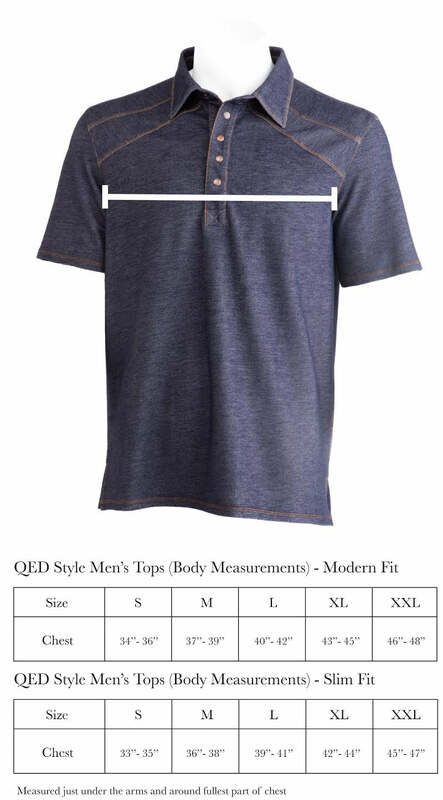 Now even the big and tall golfers will be able to enjoy QED Style. QED Style shorts are made with a water and stain resistant fabric. They can handle any of life’s activities . The waistband is lined with a rubber tape to keep shirts tucked in. We inserted a pocket on the right leg specific for ipod or phone storage . . . it’s no fun having gadgets bulking up your front pockets. On the trousers side we added to the Payson line. A favorite of our Tour players, this trouser is slightly more formal than the Park City and Alpine Trouser but still provides all of the technical requirements for the demanding golfer. Additionally, the Payson can be paired with a button down shirt and dress shoes and be worn to the office or dinner. Along with the Payson, our popular Alpine and Park City Trousers remain a mainstay of the QED Style collection. Finally, we introduced two new colors of the Newton sweater. This merino/cotton blend sweater is extremely lightweight and versatile. The original gray Newton is now joined by black and periwinkle. We hope you enjoy this new collection as much as we do, and don't forget the accessories. Our handcrafted buckles have been a huge hit, especially the golf ball core. Made one at a time, each buckle is sure to draw attention (the good kind).